COLUMBUS, Ohio -- Ohio State University researchers have developed a way to predict the resistance or susceptibility of trees to sudden oak death disease, providing forest managers with the first effective method to manage trees in infested natural areas and in adjoining areas where the disease is expected in the future. 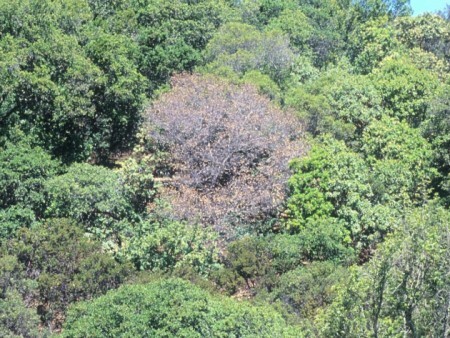 A forest disease caused by the invasive fungus-like pathogen Phytophthora ramorum, sudden oak death was first detected in California in 1995. It has since killed millions of tanoaks and trees of several oak species on the West Coast. It is also a potential threat to the valuable Eastern oak species, some of which are known to be highly susceptible to the disease. “This is the first time anyone has been able to come up with a method to predict resistance to a forest tree disease in natural populations in the field,” said Pierluigi Bonello, a plant pathologist with the university’s College of Food, Agricultural, and Environmental Sciences. The novel method employs “biomarkers” of resistance, in this case compounds found in the phloem (inner bark) of coast live oaks that can indicate whether a tree is resistant or susceptible to P. ramorum. Bonello developed a model to predict levels of resistance based on the presence of those compounds, which is the basis for their discovery. Without these biomarkers, Bonello said, it would take years to know which trees are likely to survive. Bonello’s collaborators in this research include his Ph.D. student, Anna Conrad; Stephen Opiyo, Molecular and Cellular Imaging Center, Ohio State; Brice McPherson and David Wood, University of California, Berkeley; and Sylvia Mori, U.S. Department of Agriculture, Forest Service. Also involved in the project is the East Bay Regional Park District in Contra Costa County, Calif. The new technology offers natural resource managers a non-destructive method to “risk-rate” their coast live oak stands for future sudden oak death mortality, Bonello said. The discovery is described in the Jan. 15 issue of the journal Forest Ecology and Management. According to Bonello, the benefits of this discovery are not limited to combating sudden oak death disease. “These findings also provide a useful blueprint to tackle other similarly destructive forest pest problems closer to home, such as emerald ash borer,” he said. The idea that coast live oak had some resistance to the sudden oak death pathogen was first hypothesized by Bonello’s collaborators at UC-Berkeley, who conducted a prior experiment in which trees were artificially inoculated to figure out whether diseased trees were more attractive to wood-boring insects that hasten their death. As a result, scientists discovered a wide range of susceptibility in coast live oak, including trees that seemed to resist the attack. Bonello, who was originally involved in sudden oak death research in the 1990s when he was a postdoctoral researcher at the University of California, Davis, began studying tree resistance to the disease in 2009. Funding for this research was provided by the U.S. Forest Service’s Forest Health Protection program.